The First LACUSL Lecture series of the Spring 2019 semester will occur Friday January 25th, 2019 at the American Geographical Society Library in the Golda Meir library. "Bringing Memory Home or a Journey of Rebuilding : The Digital Repatriation of the Archive of Radio Haïti-Inter"
2:30-3:30pm : " Bringing Memory Home: The Digital Repatriation of the Archive of Radio Haïti-Inter"
Radio Haïti-Inter, Haiti's first independent radio station, broadcast investigative reporting and critical analysis in Haitian Creole -- the language of all Haitian people -- from the early 1970s until 2003. It was also a voice of social change and democracy, speaking out against oppression and impunity while advocating for human rights and celebrating Haitian culture and heritage. The director of the station, Jean Dominique (the subject of Jonathan Demme's documentary The Agronomist), was assassinated in 2000, and the station closed three years later. Since 2014, the Rubenstein Library at Duke University has been digitizing the audio archive of Radio Haiti; creating a digital archive in Haitian Creole, French, and English; and conducting outreach in Haiti to ensure that as many people as possible have access to this irreplaceable piece of national heritage. 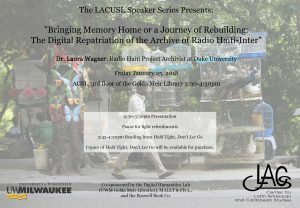 As project archivist, Laura Wagner will speak about Radio Haiti, the archive, the digitization project, and the challenges of keeping memory alive. 3:45-4:30pm "Bringing memory home or a journey of rebuilding"
A Conversation and Readings with Laura Rose Wagner from Hold Tight, Don't Let Go, a girl's journey out of the rubble of the 2010 earthquake in Port-au-Prince. Bio: Laura Wagner holds a PhD in cultural anthropology from the University of North Carolina-Chapel Hill, where her research focused on people's experiences of displacement, humanitarian aid, and everyday life in the aftermath of the 2010 earthquake in Haiti. She is currently the archivist for the Radio Haiti project at the David M. Rubenstein Rare Book & Manuscript Library at Duke University. She is the author of Hold Tight, Don't Let Go (2015), a young adult novel about the Haiti earthquake.